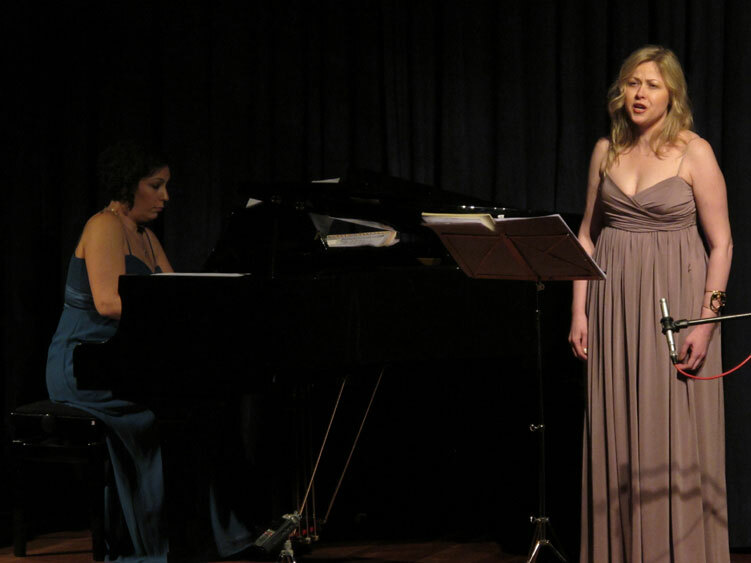 Born in Istanbul, the mezzo-soprano EZGİ SAYDAM graduated with a degree in sociology from Istanbul University, subsequently studying singing and opera with Yıldız Dağdelen and Güzin Gürel at Mimar Sinan University State Conservatory. 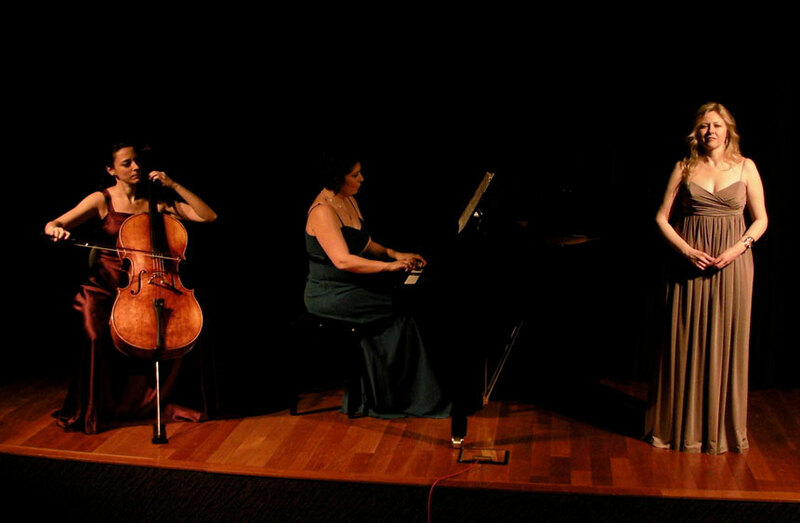 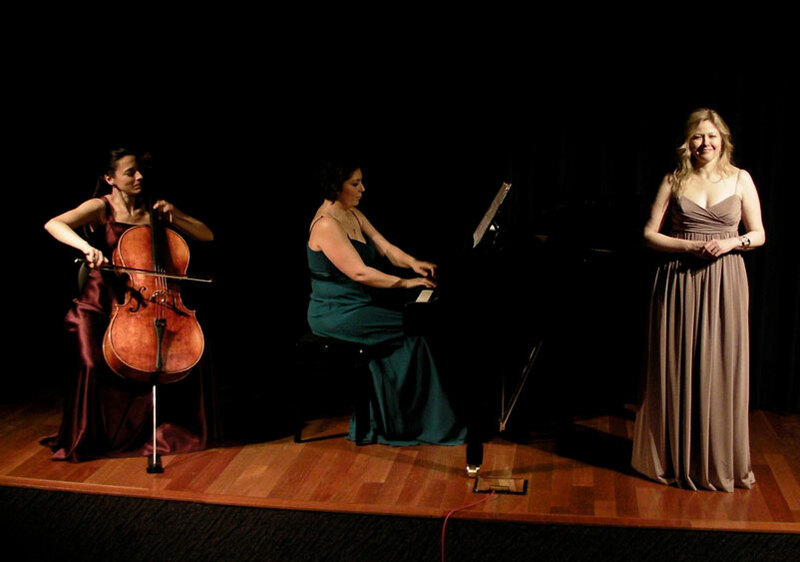 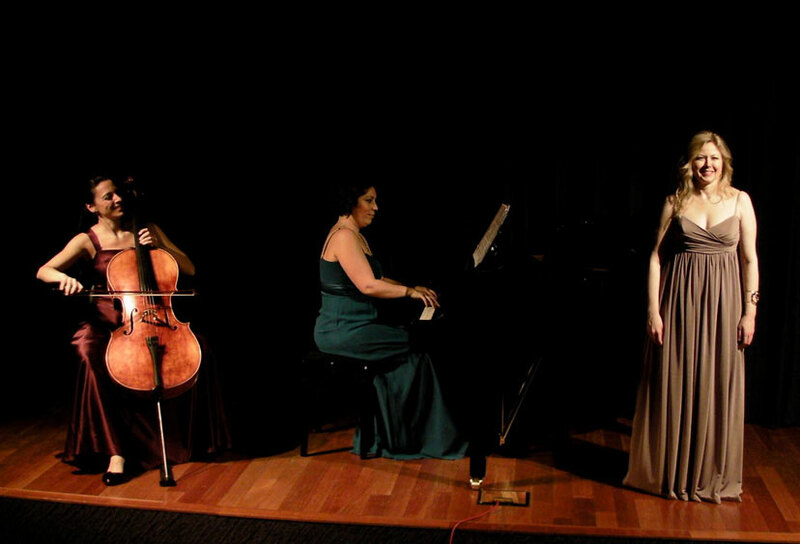 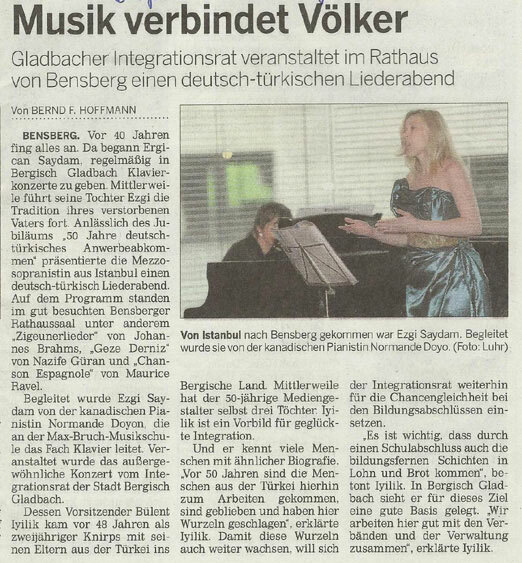 She has also worked with Hanna Ludwig of the Salzburg Mozarteum, Carol Byers and James Pearson in Vienna, and Ateş Orga at the Dr. Erol Üçer Center for Advanced Musical Research, Istanbul Technical University. 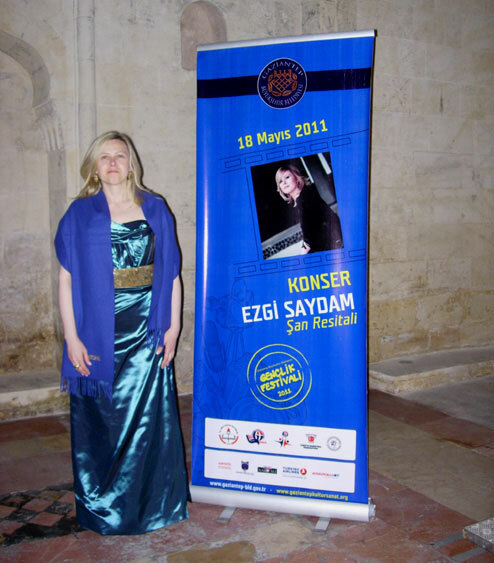 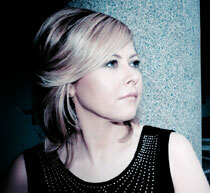 In 1995 she appeared in the Istanbul Baroque Ensemble’s tercentenary production of Purcell’s Dido and Aeneas. 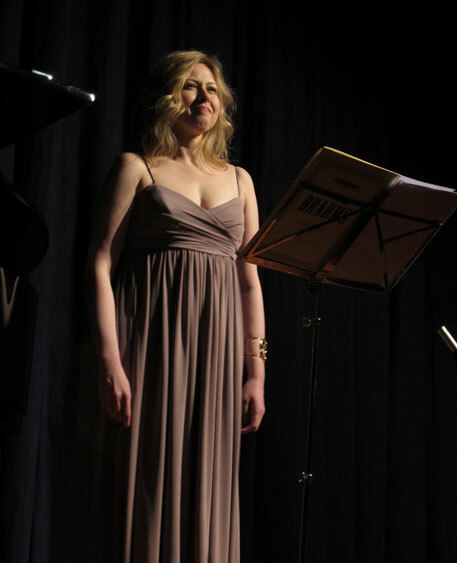 Later, at the 1997 International Istanbul Music Festival, she sang some of Beethoven's folk-song arrangements with the Istanbul Chamber Music Ensemble. 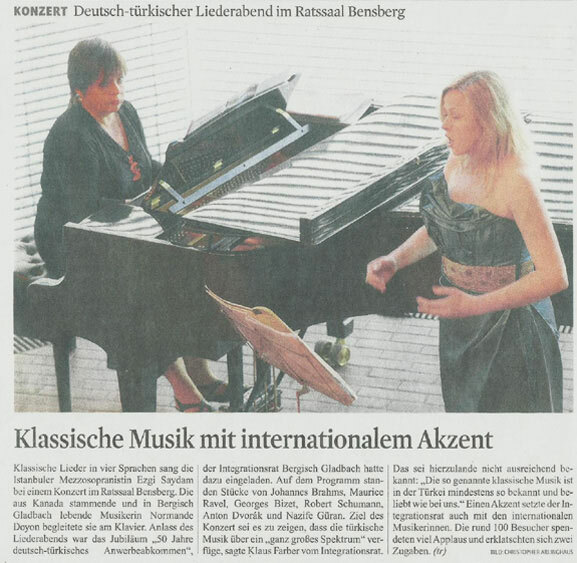 The following year, under the auspices of the Austrian Cultural Institute, she marked the bicentenary of Schubert’s birth, giving a Schubertiade with her father, the pianist Ergican Saydam. 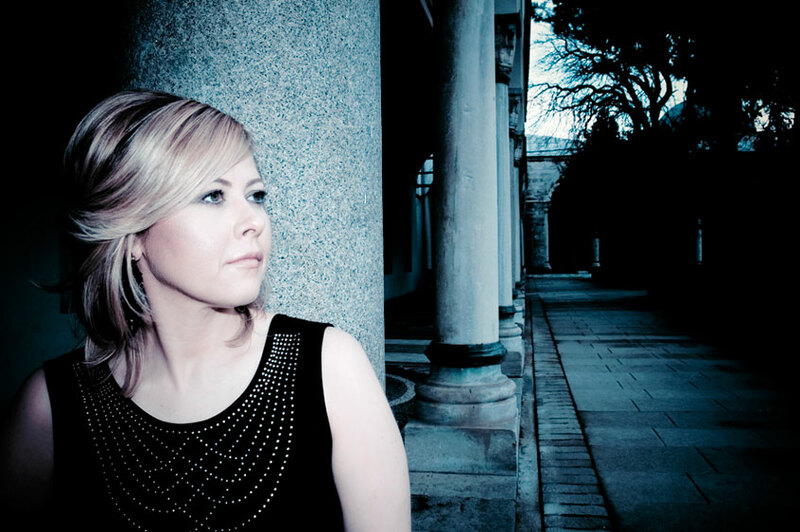 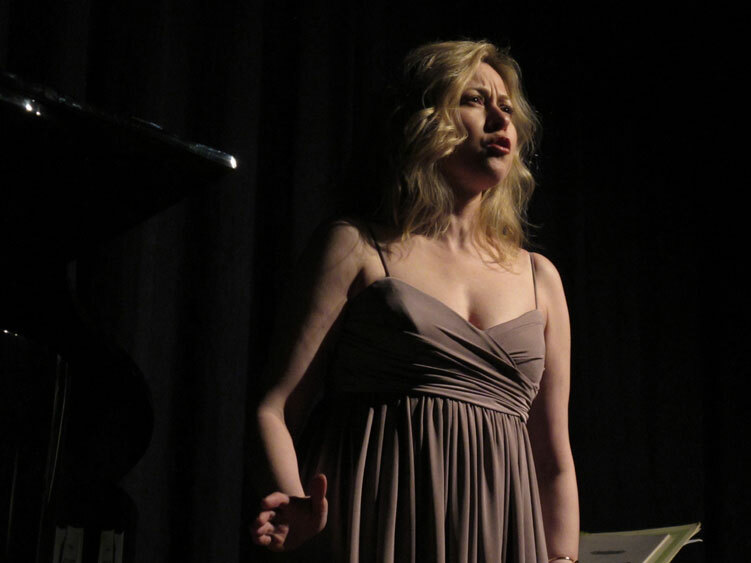 In recent seasons she has sung Lieder throughout Germany, Austria and Switzerland, as well as giving many performances of Schumann’s Frauenliebe und Leben. 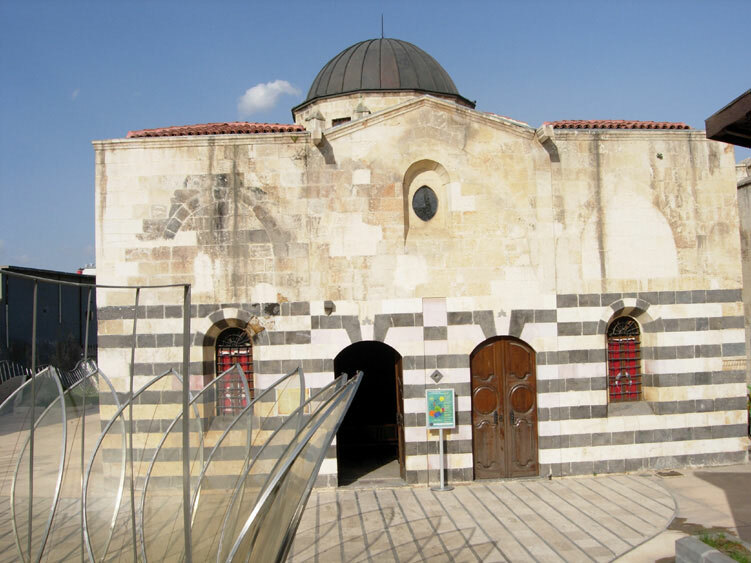 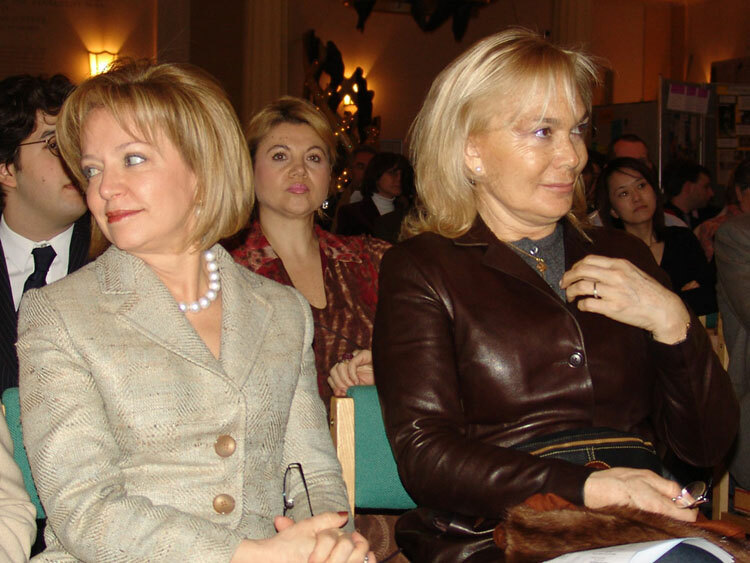 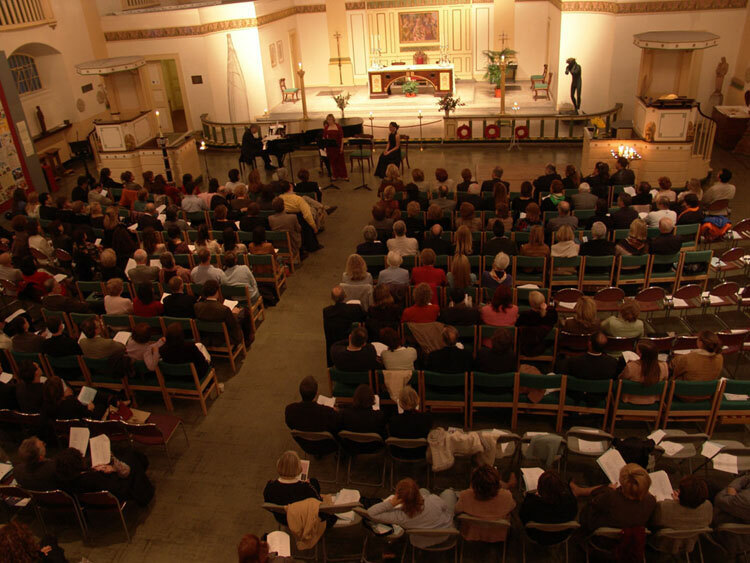 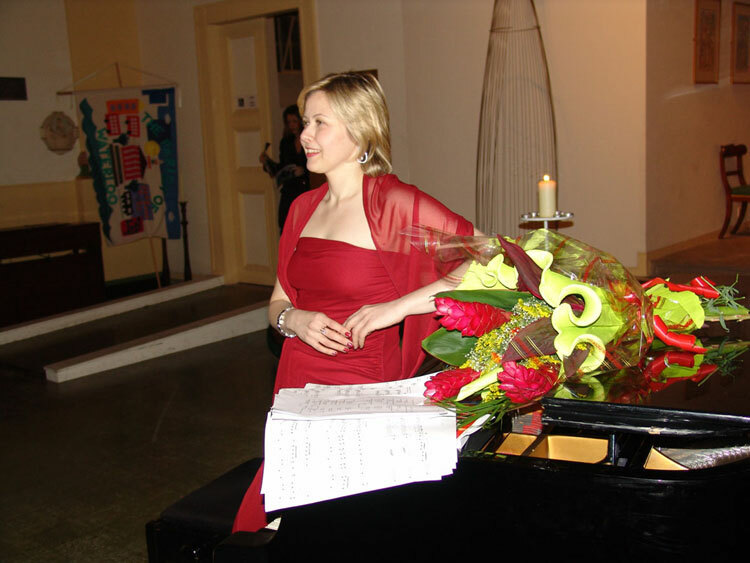 In the 2000-01 seasons, she made her London concert and CD début at St John’s Smith Square, as well as performances in Istanbul of Kamran İnce’s In White. 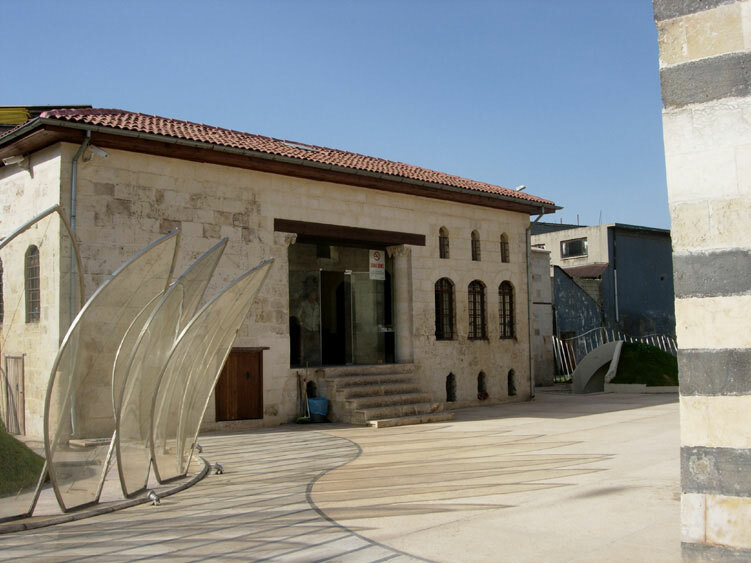 During the 2001-02 seasons, the artist has performed in Istanbul, Brussels, Germany and Switzerland, interpreting W.A. 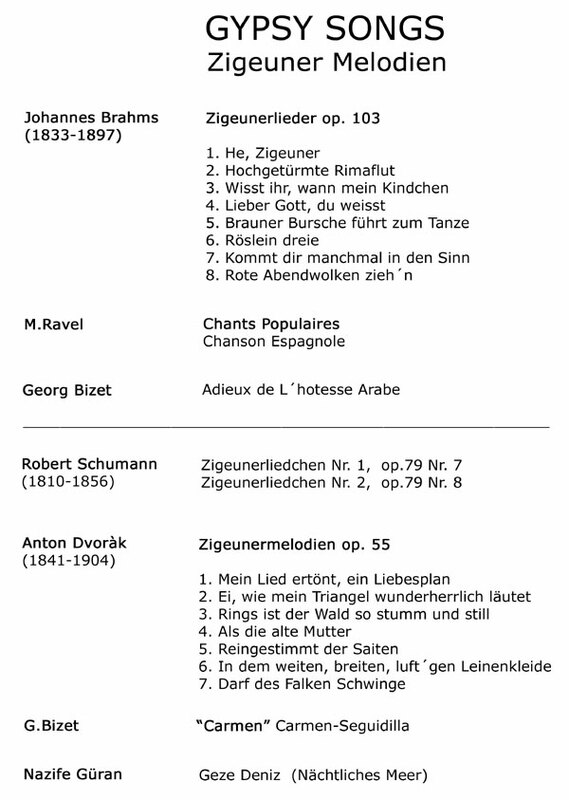 Mozart, G. Mahler and R. Schumann’s songs. 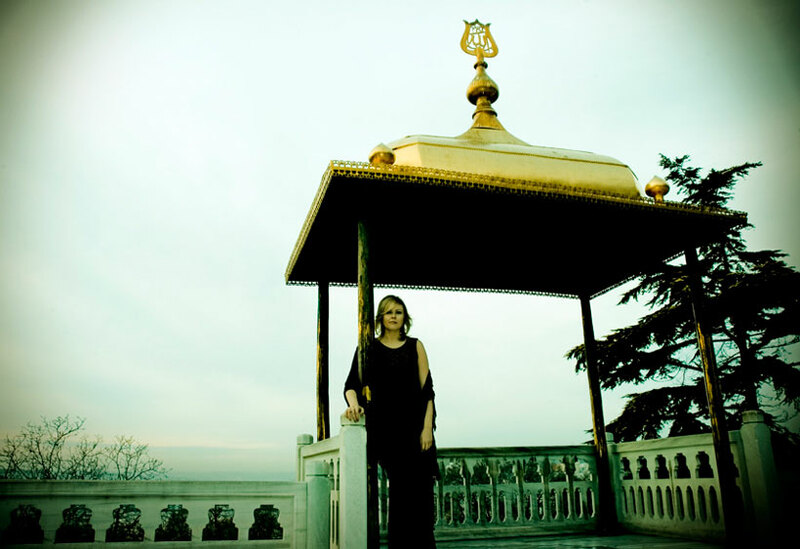 She graduated from the Istanbul Technical University, Dr. Erol Üçer Center for Advanced Musical Research with a Master’s Degree in Music Administration, in October 2002. 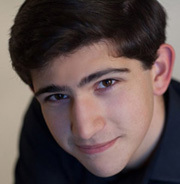 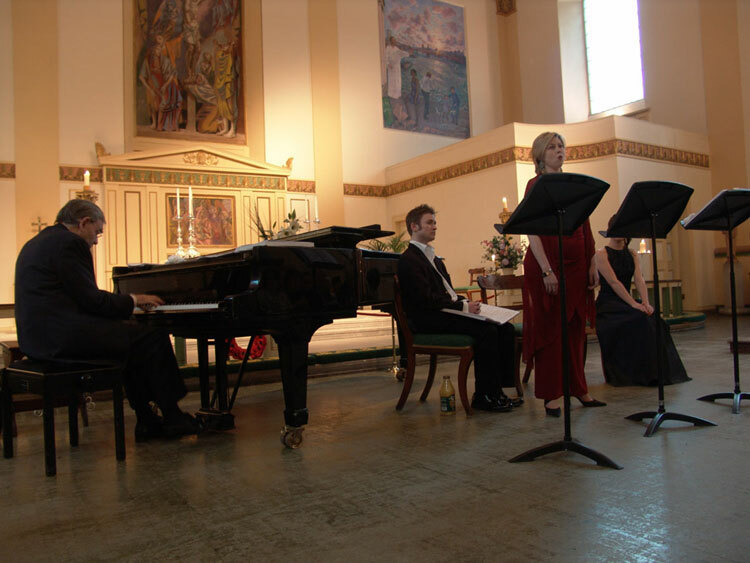 Other engagements have included recitals in Germany, Austria, Switzerland and Belgium Brussels, and a concert performance of Cosi fan tutte (Dorabella) in Vienna. 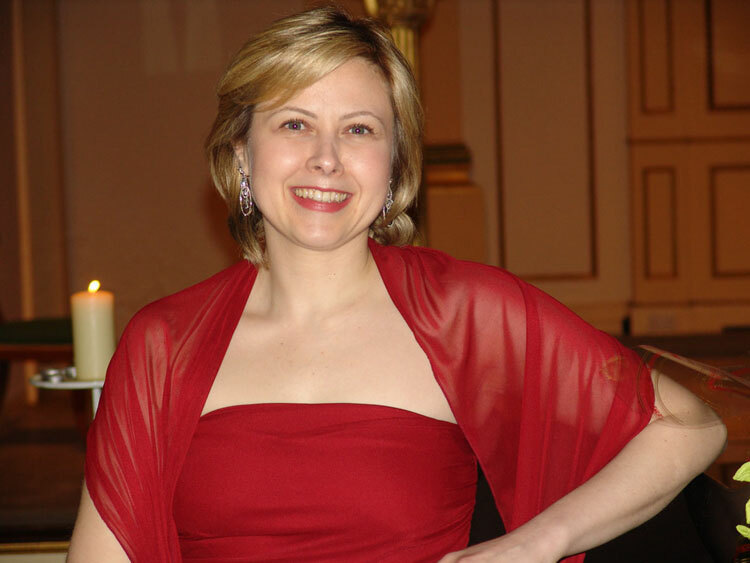 In September 2004 she appeared in England for a performance of Beethoven’s Ninth Symphony with the Manchester Camerata and Leeds Festival Chorus at the Ripon International Festival. 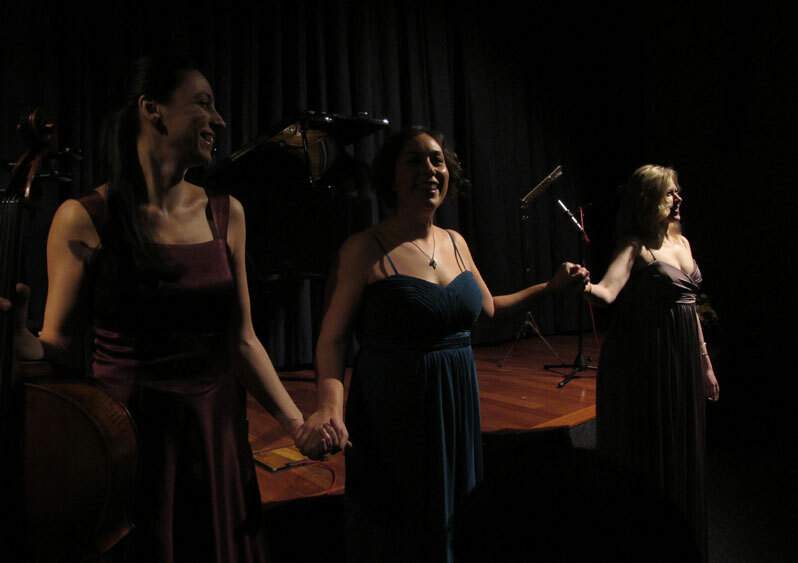 Further engagements included December 2004 Clara Schumann’s songs (op.13) in Istanbul, January 2005 appearances in Cairo and Alexandria Opera Houses, April 2006 CRR Concert Hall in Istanbul ‘20th century songs’ by Britten, Rorem, Barber, Ravel, Granados, Bernstein and Kurt Weill. 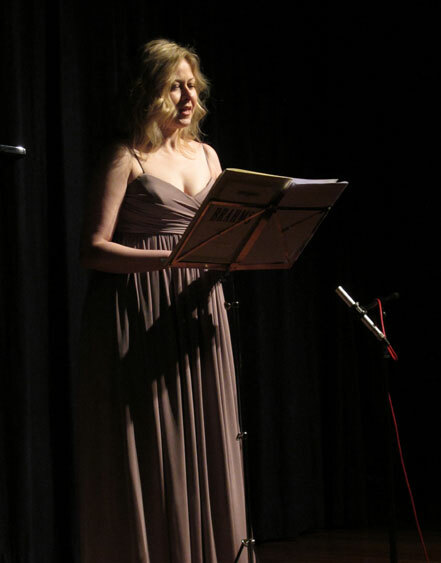 She appeared at the International Istanbul Festival in June 2006. 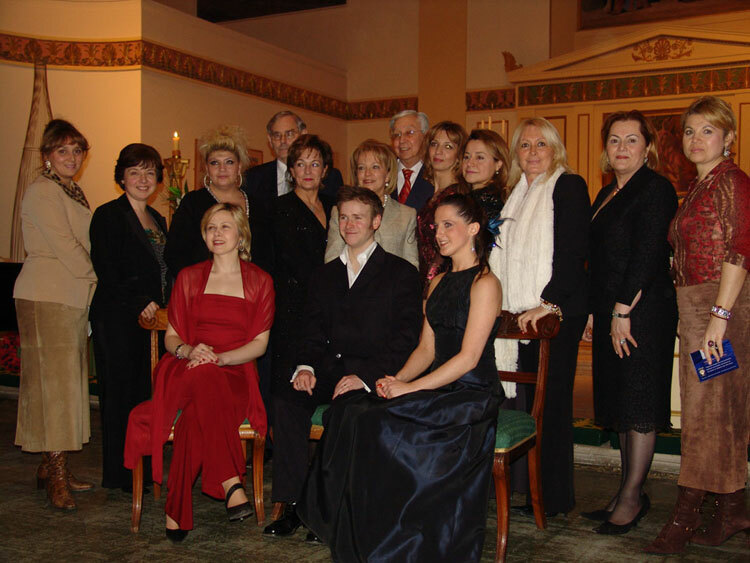 R.Schumann’s ‘Frauenliebe und leben’ was released by pb music - EMI in April 2006. 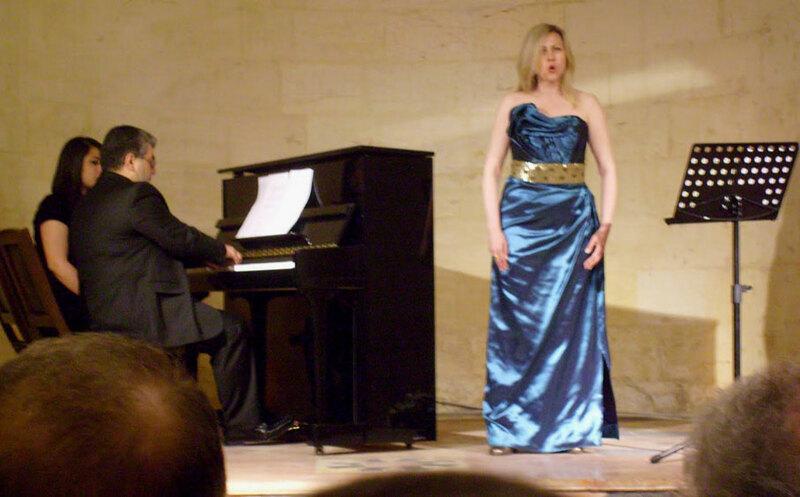 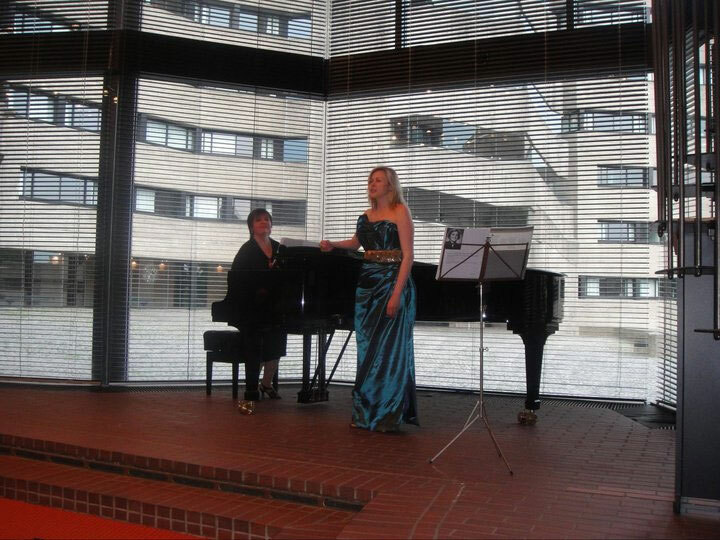 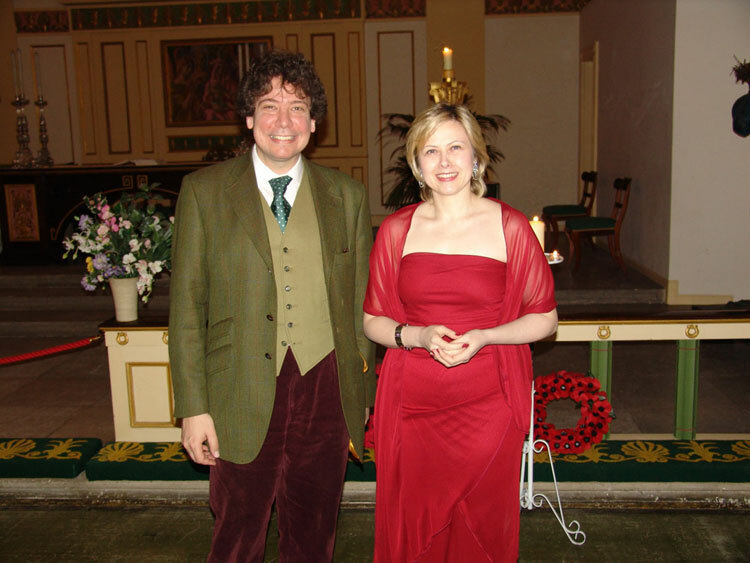 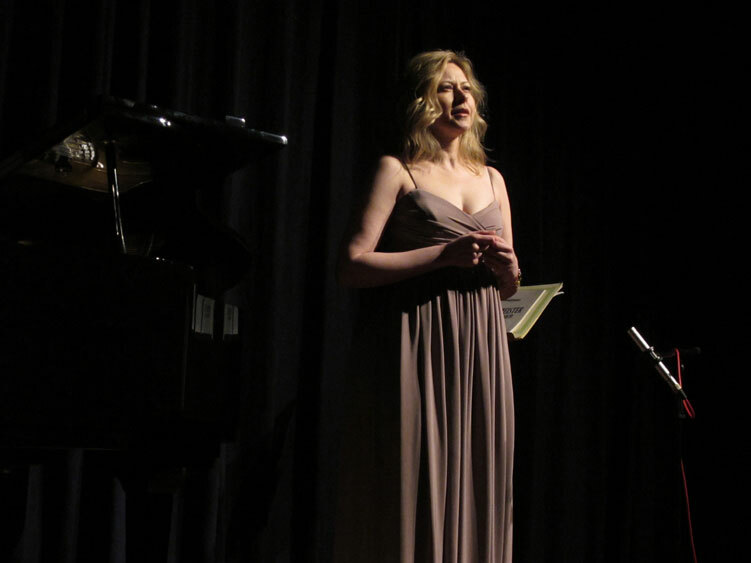 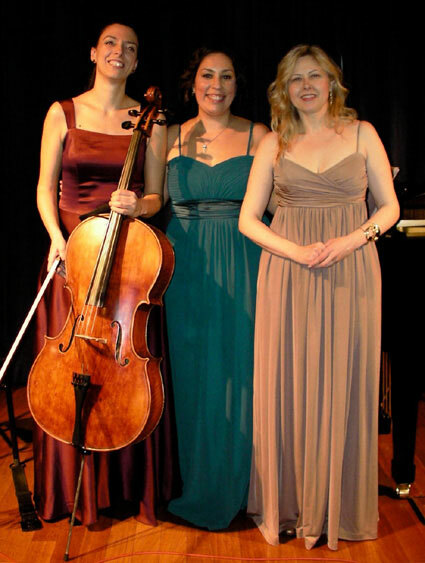 I gave a concert in Germany in April 2011, a mixed programme that included ‘Gypsy Songs’ of Brahms and Dvorak and my piano accompanist was Normande Doyon. 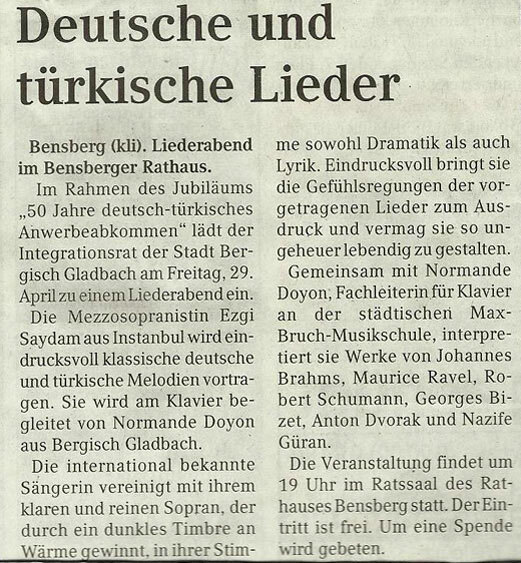 - concert flyer - photo - examples from the German press also Gaziantep, Turkey in May 2011, at the Ömer Ersoy Culture Centre (the former St. Bedros Armenian Church) accompanied by the pianist Kamerhan Turan - photos: and more recently a concert on 15th March 2012 at the Pera Museum, Istanbul - flyer as part of a trio of performers- details - photos: More recently I gave concerts in Germany, 6 November 2012, Bergisch Gladbach (Bensberger Rathaus), Germany - info and 8 November 2012, Köln - Zündorf (Kloster Kapelle), Cologne, Germany - info that included the world premiere of songs composed by my uncle Ermukan Saydam. 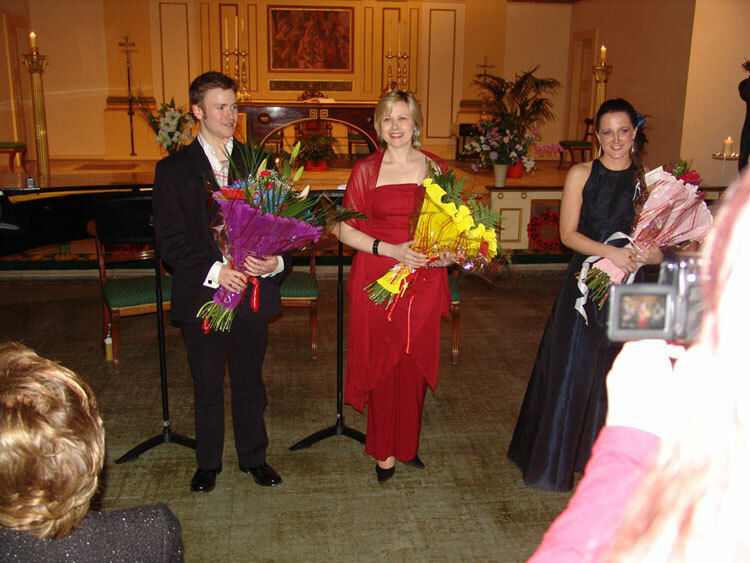 Photo selection from the Unicef concert with Ezgi Saydam, Kim Sheehan, Jonathan Mugridge and Keith Beresford, 10 March 2005.